Like a comet streaking across the heavens, Governor Nikki Haley’s comment on The View about women not caring about contraception is drawing a lot of attention. And rightly so. Poll after poll suggests that women do care about contraception. Case in point: Mitt Romney’s plan to shut down the family planning clinics run by Planned Parenthood has cost him dearly. His support among women has dropped precipitously in the past few months as voters learn more about his views on family planning. When Haley and other Republican leaders opine about the lack of voter interest in contraception, it’s more wishful thinking than political insight. They recognize that the positions taken by the GOP presidential aspirants on family planning may help them in the primaries, but it will undoubtedly hurt them in the general election. As a result, they want to change the subject in the worst way. Unfortunately for them, comments like those made by Governor Haley do nothing to shift voter attention to the issues they want to talk about, like deficits and the economy. To the contrary, they reinforce the idea that Republicans are tone-deaf on women’s issues. What’s even more “retro,” however, is the unspoken half of Haley’s comment. By suggesting that women don’t really care about contraception, she’s suggesting that men could care even less. So much less that it’s not even worth discussing. Polls, of course, suggest to the contrary. While men may feel less strongly than women do, they also care about contraception. Most men recognize that they also benefit when women are able to determine the number and timing of their pregnancies. Some men may want to keep women “barefoot and pregnant,” but it’s a pretty small minority. This is, after all, the 21st century. As governor of South Carolina, Nikki Haley ought to appreciate the critical need for family planning services. Nearly half of all pregnancies in the United States are unintended. According to the Guttmacher Institute, South Carolina’s rate of unintended pregnancy is significantly higher than the national average. In 2006, 52,000 South Carolina residents had an unintended pregnancy, a rate of 58 per 1,000 women aged 15 to 44. Guttmacher report that births resulting from these unintended pregnancies cost the state and federal governments $254 million in 2006. And South Carolina’s teenage pregnancy rate, while it’s been declining in recent years, is still about 25 percent higher than the national average according to the Centers for Disease Control. A poll released earlier this year indicated that 95 percent of South Carolinians believe that teenage pregnancy is an important issue, with 85 percent supporting school-based sexuality education. Maybe, Governor Haley should go on a listening tour in South Carolina before declaring that women don’t care about contraception. Many regard Governor Haley as a rising political star in the political firmament. She’s frequently mentioned as a possible vice presidential selection. Given Romney’s “gender gap,” adding a woman to the ticket might be a smart move, but, maybe he should find a woman who understands how women — and men — genuinely feel about contraception. Governor Haley’s comment, like the famed Halley’s comet, will soon fade from public view, but the issue of contraception will not fade anytime soon. The war on contraception is real. State cutbacks, like those in Texas, are forcing family-planning clinics to close their doors, and if GOP leaders succeed in their efforts to eliminate Title X, the federal program that provides low-income women with improved access to family planning, more shutdowns will inevitably occur. That’s why it’s so critically important that women — and men — pledge to speak out in support of reproductive health and rights. Don’t let the Governor Haleys of the world speak for you. Jeremy Lin: Where’s The Indian Version? I am as excited and thrilled with the sudden meteoric climb of New York Knicks point guard Jeremy Lin as anyone else. I am completely immersed in ‘Linsanity’ and hope he becomes a dominant superstar in the NBA over a nice long career. Jeremy Lin is the greatest sports story I’ve seen in years, perhaps decades. As an Asian-American, Lin’s brilliant play has special meaning and significance to me. However, I must admit, since I am neither Chinese nor Taiwanese, my appreciation of Lin is somewhat as an “outsider.” That is, I can’t quite reach the same level of excitement about No. 17 as my Chinese and Taiwanese friends have. I have waited many years for an Indian boy in the United States to become a professional sports superstar. Thus far, such a thing hasn’t happened, and, sadly, I doubt it will in my lifetime. The term “Asian-American” is impossibly vague, broad and diverse, encompassing everyone who claims descent from the Philippines to Afghanistan. Indeed, it’s a rather meaningless phrase, but, for the sake of simplicity, it really means Americans whose parents or ancestors immigrated from a handful of major Asian nations. According to the 2010 U.S. Census, there were 17.3-million Americans of “Asian” descent, representing about 5.6 percent of the total population. I found a breakdown of that population for 2008, which indicated that the Chinese formed the largest group among Asian-Americans at 3.6 million, followed by Filipinos (3.1 million), East Indians (2.7 million), Vietnamese (1.7 million), Koreans (1.6 million) and Japanese (1.3 million). In the popular vernacular, Indians are sometimes not even considered “Asian” since they are sometimes more associated with Middle Eastern peoples, especially since 9-11. So, with these large numbers, why are there no Indian star athletes in the United States? To the best of my knowledge, no Indian lad has ever reached the NBA or Major League Baseball. Sanjay Beach had a brief career as a wide receiver for the San Francisco 49ers and the Green Bay Packers; Brandon Chillar (whose father is Indian) played linebacker for the Green Bay Packers; and Manny Malhotra (an Indo-Canadian), plays for the Vancouver Canucks in NHL. And that’s it — and none of them are exactly ‘household names’ or superstars. Part of the problem is that Indian parents pressure their children to succeed in academics and to shun ‘frivolous’ pursuits like sports, arts and music. Hence, the large number of Indian-American doctors, engineers, accountants, mathematicians, scientists, corporate executives, and, uh, underpaid journalists. This is all fine and dandy… but, frankly, I’m rather tired of Indians in America being pigeonholed into dull, safe careers. I would be much happier if an Indian boy could pitch a 95-mile-an-hour fast-ball, or slam dunk a basketball or throw a football with pinpoint accuracy for 60 yards. Realistically, an Indian reaching the NBA and NFL is probably beyond the realm of reality. But what about America’s grand old pastime, baseball? After all, Indians have excelled at cricket – a sport that requires skills similar to baseball. If Sachin Tendulkar had grown up in California, perhaps he would now be the starting centerfielder for the Los Angeles Dodgers. If Muttiah Muralitharan were raised in New Jersey, maybe he’d be a 20-game winning pitcher for the Philadelphia Phillies. They certainly have the ability to excel in baseball. What about U.S. football? Indians are pretty good at soccer — surely some NFL club could find place for an Indian placekicker or punter, no? NFL teams have, over the years, employed a number of former European soccer players for such humble (non-violent) duties. Will we see an Indian-American athletic superstar in my lifetime (I probably have about 30 years left on this earth)? My guess is no. Most Indian parents compel their children to study subjects in school that will lead to good, solid, stable high-paying jobs. Sports are fine as long as they don’t become an obsession or, worse, a career goal. Indian parents likely tell their children that becoming a professional athlete is the longest of long shots (even if one has great talent) — and indeed, they are right. Consider that in the NBA there are 30 teams with a roster of 12 players each. Thus, for every NBA player, there are about 850,000 people in the United States. 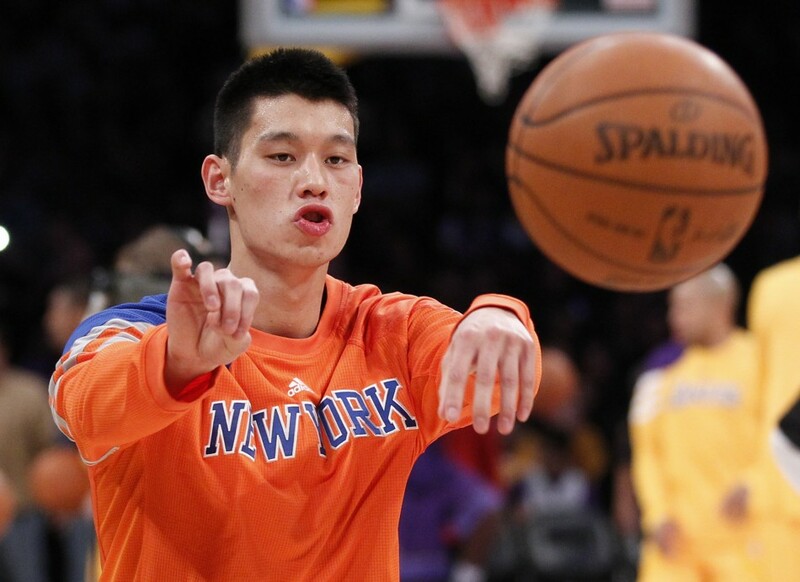 It makes no logical sense to pursue a career in sports – unless your name is Jeremy Lin, of course. And let me add that if a young Indian man rose to the top of any American sports leagues, he would likely become the number one celebrity on the planet, especially if he is telegenic. He would not only enjoy the fame and wealth that is bestowed upon those lucky few that reach the zenith of pro sports in the western world, but he would also have about one-billion people on the Indian subcontinent as rabid, devoted followers. He would be like a combination of Michael Jordan, Tom Brady, Joe DiMaggio, Elvis Presley, John Wayne and Salman Khan. It would be utterly incredible… but highly unlikely. Nikki Haley is not destined to be the first Indian American governor of a US state. No that honor already belongs to Governor Bobby Jindal of Louisiana. Haley however is poised to do something greater and that is to become the first minority female governor as she competes for South Carolina’s highest office on Tuesday November 2. Already the first Indian to hold office in South Carolina, she currently serves as a member of the South Carolina House of Representatives from the 87th district. A past president of the National Association of Women Business Owners, she is a CFO and an accountant by trade who worked in her mother’s apparel business that has grown into a multi-million dollar company. Although born to Sikh parents, she converted to Methodism after marrying her husband Michael Haley and describes herself as a Christian. Her religious conversion as well as her ethnicity has not hampered her dreams of becoming the first female governor of South Carolina. Neither have allegations of extramarital affairs or reports of paying taxes late. Nikki Haley’s candidacy received a boost when Sarah Palin and Tea Party officials gave her their backing for the election and she is leading her opponent, Democrat Vincent Sheheen, in most polls. If she wins, this will not be the first time she has won in a state where politics is mainly a male run enterprise. In 2004, she challenged and won against Rep. Larry Koon who was South Carolina legislature’s longest serving member, having served 30 years in the House. She is a tough lady who also happens to have a concealed weapons permit and strongly supports gun rights, a staple of Republican Party values. Aside from Haley, an unprecedented number of Indian Americans are contesting for office this year across the country. There is Manan Trivedi in Pennsylvania running for the House of Representatives in the state legislature. Others running for house seats in their states are Ami Bera in California, Raj Goyle in Kansas, Ravi Sangisetty in Louisiana, where Bobby Jindal is the governor, and Surya Yalamanchili in Ohio. After making inroads into American boardrooms with top jobs in the corporate world such as Vikram Pandit, the CEO at Citibank and Indra Nooyi, the boss at PepsiCo, Indian Americans are exploring opportunities in politics which is good for America as more involvement by minorities in public service makes the country stronger and shows that there is room for everyone at the top. Many other minorities also can take encouragement from her candidacy and be mindful that race and ethnicity is not always a barrier for running for office and that the right candidate and platform can land a person in the governor’s mansion. Should Nikki Haley be successful in winning the governorship of South Carolina, she will instantly become one of the rising young stars of the Republican Party and a face for women leaders the world over. Regardless where you stand on the political aisle, her candidacy and subsequent election will be a turning point in the US for Indian Americans and South Asians who have become an ﻿﻿﻿﻿indispensable part of the nation’s fabric. Pakistanis for Peace Editor’s Note 11/03/2010– We at Pakistanis for Peace want to congratulate Nikki Haley for winning the governorship of South Carolina in a very tough and hard fought race. Both as an American as well as ethnically being a person from the Indian subcontinent aka Desi, we are proud to see her elected to serve as governor, despite disagreeing with her party on many issues. The story of Abdul Sattar Edhi is an awe inspiring one. Amidst the daily materialism, frenetic rat race, ambition and angst which envelops one, here is a man who only thinks of others and their suffering. Edhi single-handedly set up the Edhi Foundation in 1957, and continued to operate it as a non-profit social welfare organisation. 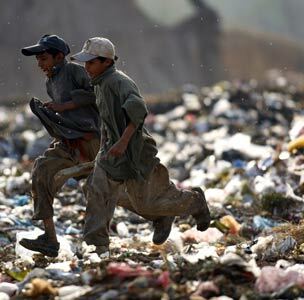 Over 300 centres of the Edhi Foundation span the length and breadth of Pakistan, and provide the needy with medical aid, family planning, emergency assistance and education. There are also maternity homes, mental asylums, homes for the physically handicapped, blood banks and orphanages, among other services. The remarkable Abdul Sattar Edhi has no qualms about going where others fear to tread, and for taking a stand against extremism. He went to Tank, the gateway to the tribal areas, although he was advised against travelling to such a volatile and dangerous place. There were fears that he might be killed by the Taliban, but instead they welcomed him with open arms. Edhi tried to reason with the Taliban and told them bluntly that they should renounce their violent way of life, which is against the teachings of Islam. The Taliban called him a ‘’Khudai Faqir’’ and listened to him with great respect, and provided him with safe passage. 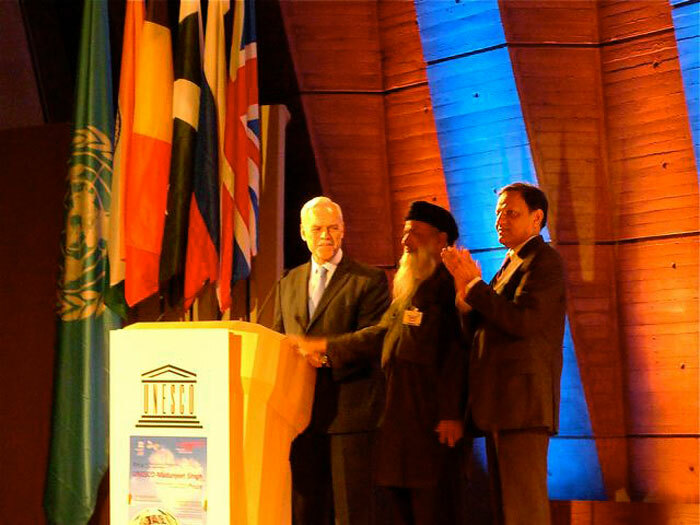 Edhi was recently awarded the UNESCO Madanjit Singh Prize for the Promotion of Tolerance and Non Violence. He was conferred the award in recognition of his life long efforts to ameliorate the condition of the most disadvantaged groups in Pakistan and South Asia, and for promoting the ideals of human dignity, human rights, mutual respect and tolerance. The prize giving ceremony was held on November 16, the International Day for Tolerance, at the sprawling United Nations edifice in Paris. Amidst all the fancy suits, designer coats and gleaming shoes, Abdul Sattar Edhi stood out in his simple Shalwar Kameez and worn slippers. A documentary was also screened, which showed Edhi and Bilquis Edhi, his wife and companion of 50 years, engaged in their charity work amidst the poor, disadvantaged and outcasts of society. As Edhi rose with difficulty to receive the UNESCO award, there was prolonged applause for this great Pakistani. Many Europeans remarked on how privileged they felt to have the opportunity of meeting such a great man. An Indian couple postponed their flight home, and came to the UN to pay homage to Edhi, saying that they only wanted his blessings. As soon as the impressive ceremony was over, Abdul Sattar Edhi was surrounded by a bevy of delighted Pakistanis. Their stimulating interaction with Edhi and the countless photo opportunities went on and on, until some UN officials started glancing at their watches, and it was obvious that it was time to leave the hall. But then the dinner invitations started rolling in. At times, Edhi looked a trifle tired, but he never lost his composure. At 88, and grappling with diabetes, life could not be easy for him, but he always seems to think of others. Accustomed to sleeping at 7pm and waking up at 4 am, jet lag and the constant socialising must have been draining. When asked how he was feeling, Edhi admitted that he was exhausted, but said that he did not want to turn down the opportunity of meeting with Pakistanis. Many Pakistanis sought his blessings and said they were willing to contribute to his organisation. Despite all the hero worship, Edhi remained calm and focused, displaying none of the whims and attitude which signifies the behaviour of many Pakistanis who have not achieved even an iota of what he has. Notwithstanding his lack of formal schooling, Edhi came across as alert, witty, mature and savvy. Talking to him is an enriching experience indeed. He refuses to espouse any political party, because he likes to steer clear of politics. What motivates this octogenarian to work for such long and punishing hours. and refuse to take time off? 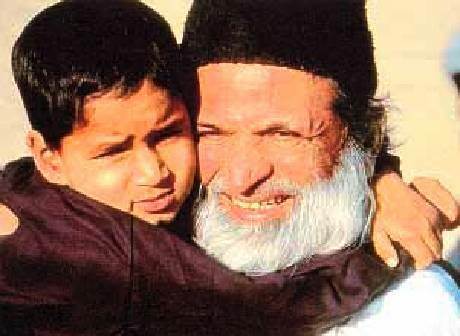 When he was still a child, Edhi’s mother became very ill and he nursed her for years until she passed away. “I had accepted at the outset that charity was distorted and unrelated to its original concept. Another major obstacle in the promotion of welfare was the disgust of man towards mankind. There was only one reaction from everyone ñ cringing. From the grimacing faces of my colleagues, I understood that I was the only one not disgusted. They washed their hands vigorously, smelt their clothes repeatedly and complained incessantly of the stench having seeped under their skins. Abdul Sattar Edhi has devoted his life to a thorny field where hardly any one can match his dedication, focus, common sense and sagacity. Being in his presence gives one hope for the future, because it is his belief that there are no people more generous than Pakistanis in giving aid, and there is no place in the world as great as Pakistan. Washington DC, USA- Actor Kal Penn, best known as Kumar for his “Harold and Kumar” movies and a stint on the TV smash hit “House”, started his first day officially in the Obama administration as the Associate Director in the Office of Public Liaison, with a focus on connecting President Obama with the Asian American communities as well as arts and entertainment groups. Penn had campaigned extensively for Obama throughout the country leading up to the elections and had become a huge hit on college campuses nationwide due mainly to his Hollywood celebrity status and his large cult following among the youth because of his “Harold and Kumar go to White Castle” and the sequel “Harold and Kumar Escape from Guantanamo” movies depicting the misadventures of two New Jersey guys. He also appeared in roles on the television hit shows “24”, “House”, and other notable movies such as “Van Wilder” and “The Namesake” among others, making him the most successful Indian American actor today. Penn explained that he felt “incredibly honored to get the opportunity to go to work in the Obama White House” and that he got to know the President during the campaign and expressed his interest to in working for the administration in some capacity. Although his White House job pays a fraction of what he made yearly as an actor, he stated that he had always been interested in politics and public service ever since he heard stories from his father about his grandfather marching with Gandhi back in India for freedom from the British. 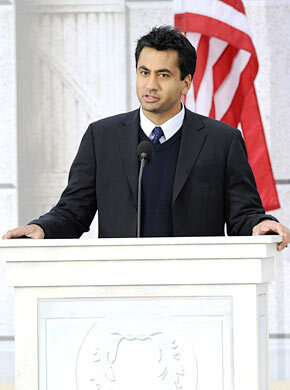 Kal Penn’s main focus as Associate Director in the Office of Public Liaison will be to act as the point person for the affluent and rapidly growing community of South Asian Americans from India, Pakistan, Bangladesh, Nepal and Sri Lanka, colloquially known amongst themselves as Desi or countrymen in Hindi and Urdu. He will also be Obama’s main contact to the entertainment and arts community and as an actor brings an array of contacts with the influential Hollywood community. Penn’s appointment in the Obama White House is a great step in bringing to attention and putting a face on the often forgotten but very important segment of American society comprising of South Asians who are some of the most successful businessmen and women and also is the ethnic group with both the highest average educational qualifications and earnings of any national origin group of people in the United States. Although it is not believed he will be instrumental in any foreign policy endeavors relating to India and Pakistan’s conflict, it will nonetheless help the community at large in the US knowing that they have a specific person in the White House charged with South Asian Americans issues and concerns from an American perspective. We at Pakistanis for Peace have always enjoyed Kal Penn’s movies and roles, and look forward to his contributions in the Obama administration as a liaison for the Desi community in the United States.